← First Visitors to C est la Vie – 7 days to go! You may remember a blog I wrote on 24th February about a train journey to Sligo. 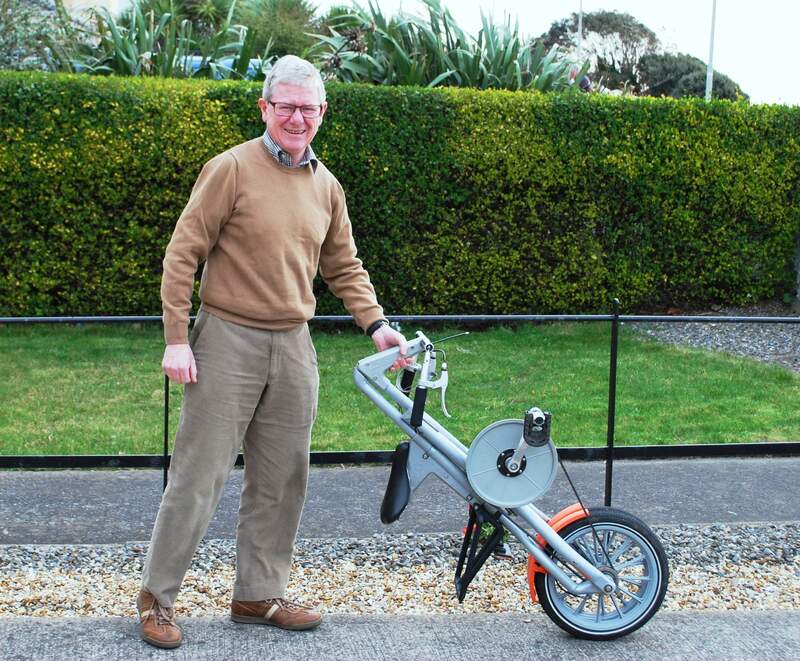 I recalled the story of meeting a man from Carrick on Shannon and his strange folding bike. He had bought it on the Internet and imported it into Ireland. He was very enthusiastic about it and gave me a demonstration on how it worked. The big advantage to this bike was that it folded up, wheel it like a pram, take it on a train and store it indoors. I was enthusiastic about it but when he said it cost €800, I wrote it off in my mind as being too expensive and decided we would have to do with our standard bikes. 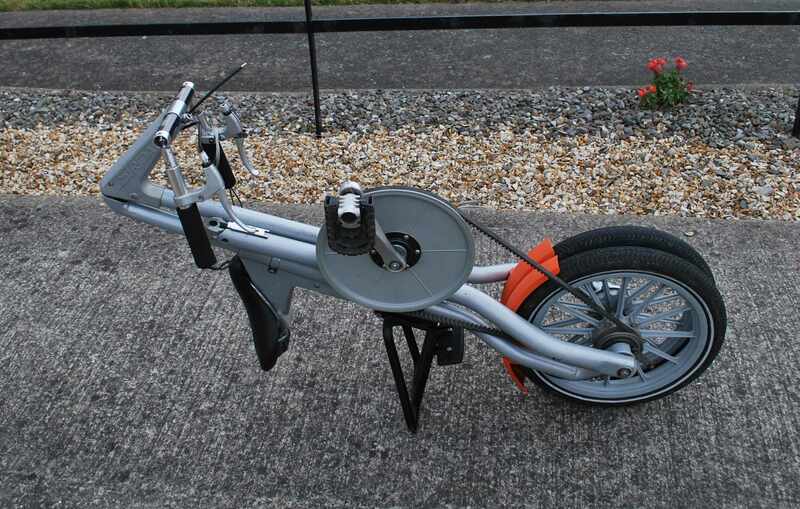 But when I put the story of the bike in the blog, my friend Bill Kee rang me to say he had enlarged the blog photos, then could see the name of the bike and had found second hand ones on the Internet for about €300. Nuala went looking for one online. She found a Strida bike within 4 miles of our home, under our noses. These bikes are just what we need. On our journey, bikes are critical, they are our only real means of transport when not on the boat. Because Strida bikes can fold up easily, we can store them in the boat rather than outside on the stern. This reduces the risk of them being stolen or damaged. Also like the man from Carrick on Shannon, we can take them on the trains. 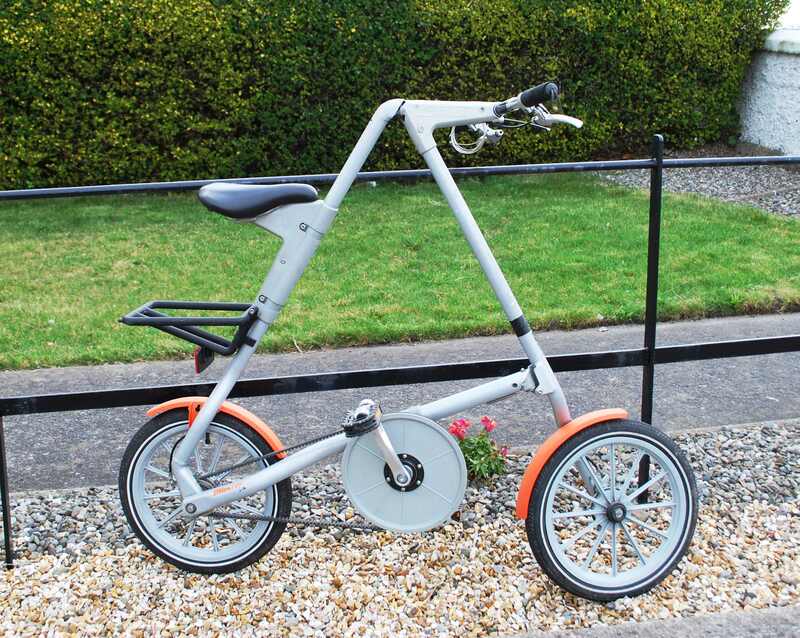 So this makes the Strida bike perfect for our use. So last night I went and had a look at the bike and bought it for €100. Ok, it needs a good clean up, the bright orange mudguards are naffy and the back brakes need to be fixed but at €100, it’s a bargain! After I had bought the bike, I told Philip the seller about our travel plans and that his bike was going to France and Germany. I gave him one of our cards with the blog address on it. He looked at the card and then at me and said “Gap Year? So you left college this year then! !” (I suppose he thought he could be cheeky now that he had my money!) So I explained to him what we were doing and why. Now I just need to find a second one and have only 6 days to find it. So does anyone know of one out there? Its funny how this Gap Year is unfolding and the things we need just keep showing up. This entry was posted in Getting Ready for Gap Year, People We have Meet on the Gap Year and tagged bikes, means of transport. Bookmark the permalink. Hi Philip. Brakes fixed today. Going to take it for a test drive this evening. Thanks for looking at the blog. You can see where your bike goes if you follow it. Cheeky comment bit of poetic licence ! Yes we will send dates we will be in Germany. Looking forward to meeting you.